I just finished reading Three Cups of Tea . It is the story of Greg Mortenson’s transformation from a part-time mountaineer to a full-time doer of good. Mortenson’s humanitarian efforts began by building a school for a remote mountain village in Pakistan. Since then, he has gone on to co-found the Central Asia Institute and build more than 50 additional schools throughout Afghanistan and Pakistan. This story is an inspiring adventure that shows just what can be achieved when someone puts their mind to it. Two weeks ago, under the influence of a couple margaritas, I announced that I was going to get rid of my cable. The margaritas had little to do with the decision, although, they seemed to aid in making the public announcement. The real decision came when I happened across The Surreal Life one night a few weeks ago. 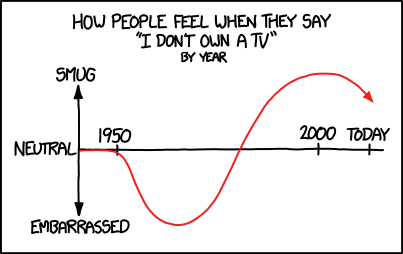 Now, there’s no shame in watching The Surreal Life (actually, there probably is, but that discussion is beyond the scope of this post), but when I caught myself thinking “Hey, this isn’t half bad” I knew my relationship with cable television was about to come to an end. As is the case with ending most long term relationships, the decision to end it is actually easier than the act of doing so. There were a couple of nights last week when I simply refused to acknowledge the existence of the vile box, and I felt better for it. There was at least one night when I reached for the remote and turned on the power. It felt good when the blue glow flooded the room, but in the end, I just felt guilty. Then there was Sunday, just one last episode of The Wire. If I had only watched last night, I might have kept the cable box for another week, but I couldn’t control myself. At 10:00, I flipped over to VH1 and watched The Surreal Life. I felt dirty. So, after work tonight, I came home and removed the cable box from its home under the DVD player. Then I marched down to Time Warner’s office and bid farewell to that infernal box forever. Okay, standing in line for 15 minutes chilled me out a little bit, but handing that box over felt great. A few good shows will be missed here and there. Nevertheless, if that is the price I have to pay for not having countless hours sucked up by crap television, so be it. The general lack of reception in my apartment will ensure that my television viewing is restricted to DVD only. Goodbye television (at least for now).